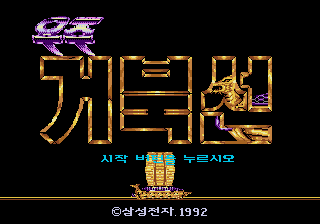 Uzu Keobukseon (우주거북선, meaning Space Turtle Ship) is a 1992 shoot-'em-up by Samsung released exclusively in Korea for the Sega Mega Drive. It is the only first-party Mega Drive title produced by Samsung, who was Sega's hardware distributor and software translator in Korea. shoots, drops a bomb (which is available in a limited supply), and changes weapons. Powerups are scarce, though they do exist, and new weapon powerups will give the ship an extra hit.